After learning about different methods for processing coffee beans and getting our buzz on at Joe Van Gogh’s coffee roastery, the TerraVITA 2012 Media Farm Tour group headed on to the next stop in our jam-packed day. That stop was Whitted Bowers Farm in Cedar Grove, NC. It’s owned by Rob Bowers and Cheri Whitted Bowers, fellow Californian transplants (we are everywhere!). Our group walking toward the cabin. 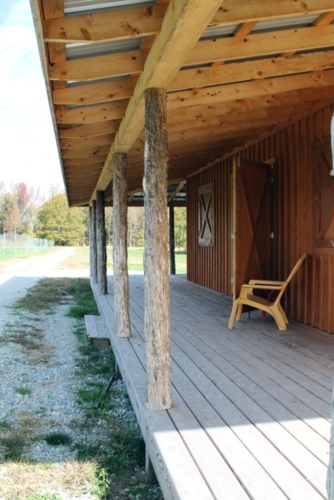 Entrance to new wooden cabin used for the strawberry you-pick season. 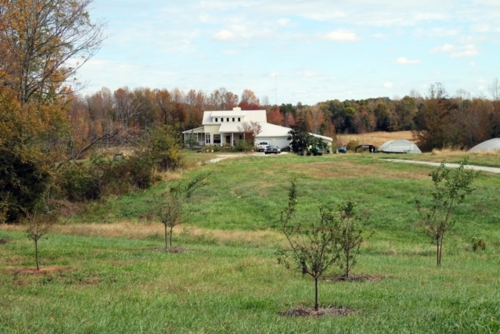 Whitted Bowers Farm is 52 acres, and when the farmers purchased it, the only structure was the house. The house in the distance. Rob, who has that rugged farmer’s look, spoke with us inside the cabin to keep warm, and we learned an amazing amount about biodynamic farming in a short period of time. 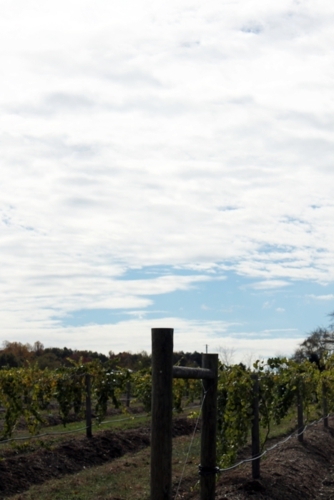 The farm is the only one on the East Coast certified as both organic and biodynamic. 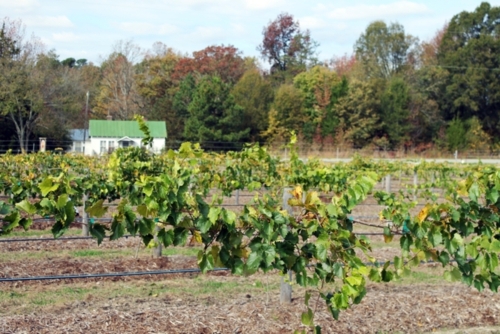 What is biodynamic? Before this visit I had heard about biodynamic farmers burying cow horns but that was all I knew. 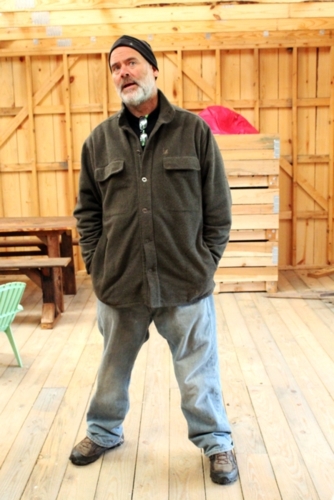 Rob said the idea of biodynamic farming techniques is to make the soil itself better and more fertile rather than viewing it solely as a medium for plants to grow in. That cow horn example is real, but it’s not just a crazy tradition. The cow horn is filled with manure and buried on the autumn equinox. It is unearthed at the spring equinox, and the manure is then mixed with water to make a fertilizer. 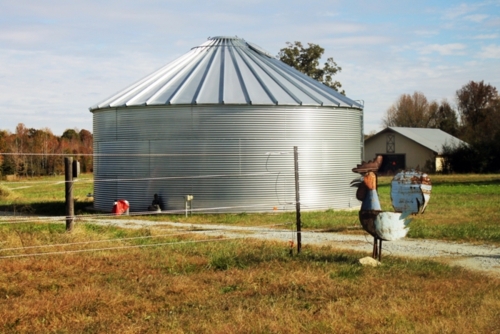 Once completely made, a 1/2 cup of the fertilizer can provide an acre’s worth of coverage. So it’s definitely more concrete in intention than just quirky farming. 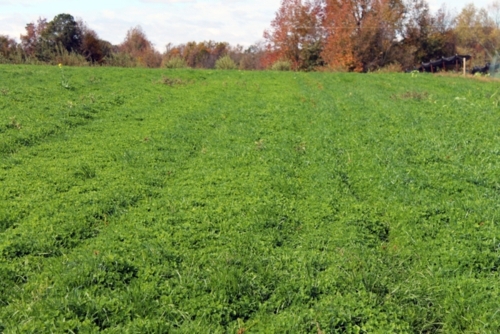 Fields overrun with clover for this next season. 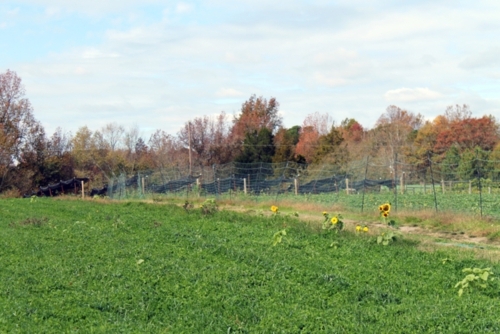 Sunflowers breaking through the clover-blueberry fields. Rob talking about the various crops behind him that included blackberries and raspberries. Rob explained that biodynamics involves a lot of precise methods that stem from believing that the planets and stars impact their crops. He was surprised when they moved here to hear locals confirm some of his beliefs from their own folklore, specifically giving “everybody knows you don’t plant potatoes under Pisces” as an example. 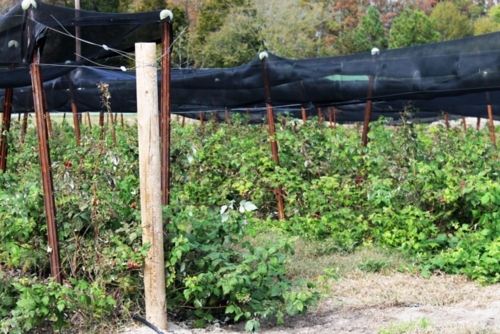 This method of farming is much more common in Europe, and Rob uses it because it works. They’ve been able to grow peaches, pomegranates, Jupiter table grapes, and plums organically when they were told such crops could never be grown in this area. Another of Rob’s goals is to show that a family farm can support itself as long as the family is committed to that land. The family focus must always be the farm—once the focus turns to outside jobs, for example, the farm is much less likely to succeed. 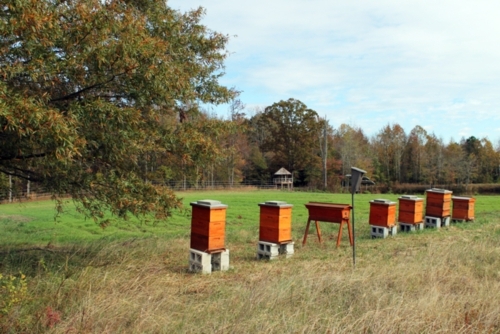 —but Rob is working with the Xerces Society’s pollinator conservation program and David Orr of NC State on encouraging more native pollinators, keeping part of the fields growing with native plants that may help bring them back. Native pollinators have been decimated due to development, and as you may imagine, those pollinators are better for farming than honey bees. 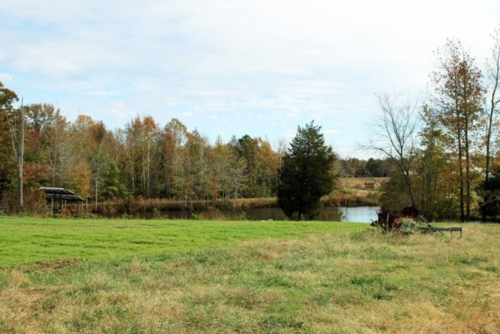 The farm gets a lot of its water from a stream-fed pond, but not all of it yet. Figs are grown near the pond for the water proximity. 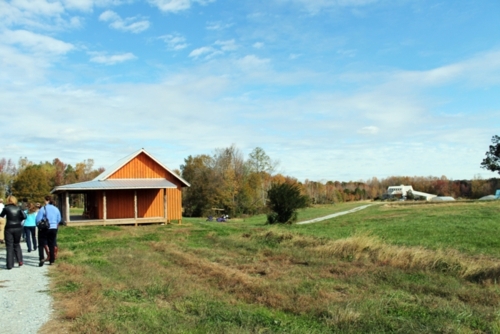 They are working on collecting water runoff from the buildings to make the farm entirely self-sustaining for water. As we neared the end of our tour, Rob shared that he is still rehabilitating the soil from tobacco fields on his land that were abandoned in the 1940s. There are furrows evident from the machinery used then and much work is left to do to reclaim that land even though it’s been 70 years since it was stripped of nutrients from the constant use at that time. 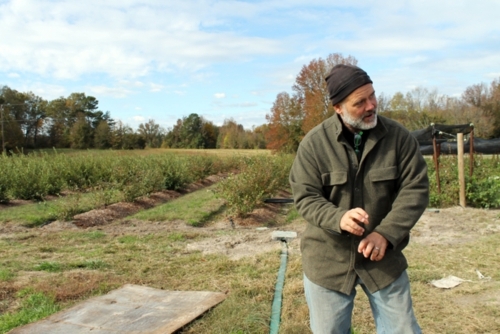 Whitted Bowers Farm sells most of their product at the Carrboro Farmers’ Market and to a number of local-ingredient-focused restaurants in the area. If you visit for the strawberry you-pick season in the spring or meet him at a farmers’ market, he would love to talk with you about biodynamics. Educating others about it is a passion of his, and I must say, he’s remarkably good at it. Next stop on the Media Farm Tour is Boxcarr Farms and lunch!